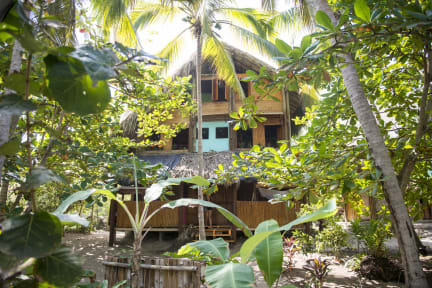 La Brisa Tranquila is a backpackers paradise. We stayed in one of the cute beach huts with views of the sea and had an amazing time. The food and atmosphere were both great. The only downside in my mind is that its not very 'Colombian.' 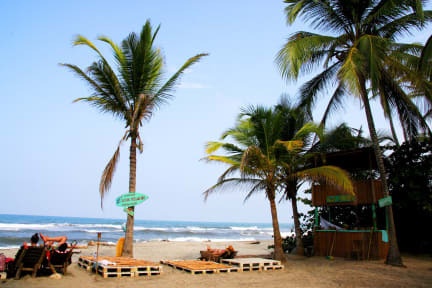 If you are looking for an authentic Colombian experience this is not it, but its perfect for relaxing on the beach, eating and drinking well. My favorite place in Colombia! Had a great time chilling and getting some sun at Costeño Beach. The staff at La Brisa Tranquila is super friendly, the property is beautiful and you feel very safe here. My only suggestion would be to add a few fish/seafood options to the menu since we are at the beach! Other than that, I would highly recommend staying here. I really enjoyed my stay here, was with friend. would recommend. Dont book the private with shared bathroom!! I booked the private with shared bathroom but thr cabins are right next to the bar. Music was really loud and the bar wasnt helpful at all. The bartender told me I am lucky that itsnot open till 03 am as usual... all staff at the bar were not really friendly. Staff at the reception on the other hand are really helpful! The beach is ok. The bar needs to improve! The menu is repetitive after a few days. Bedrooms of 2 people are very small. The bed was wet and had holes in the middle. The foreign staff does not know anything about the bar! They are always lost and some do not even speak Spanish. There are too many people working but it is not functional. The bonfire made every night is a plus. Perfect location and good restaurant with a good variety of food for different budgets. I’m for sure above the average traveler here age wise (30) and might have different expectations for the dormitories. But I did feel like that the dorms here were way to cramped up and beach dirty. I felt like a rat in a cage tbh. I didn’t drink in the evening, which might be why it bothered me as I spend time in my bed. Local staff wonderful and helpful. Didn’t live the attitude of he volunteers.